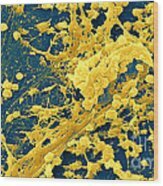 There are no comments for Staphylococcus Biofilm. Click here to post the first comment. 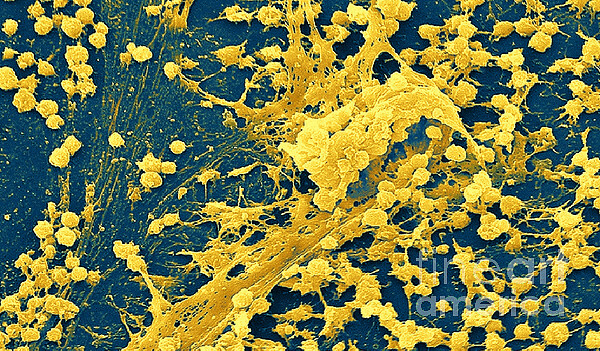 Color enhanced scanning electron micrograph of a Staphylococcus biofilm on the inner surface of a needleless connector. A distinguishing characteristic of biofilms is the presence of extracellular polymeric substances, primarily polysaccharides, surrounding and encasing the cells. 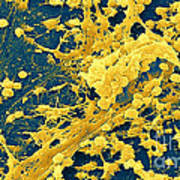 Here, these polysaccharides have been visualized by scanning electron microscopy.